Garage: "1 EXTERIOR PARKING SPOT"
Great location!!! Close to all great things that Marco Island offers! Enjoy incredible sunrise and sunsets and of course the awesome and beautiful views of Clam Bay. This lovely home features 2 bedrooms and 2 bathrooms plus a good size lanai with amazing views. This condo is tastefully furnished and decorated and sold turnkey. 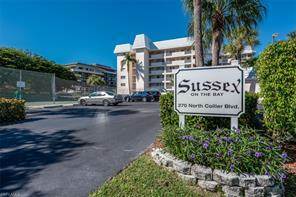 Sussex is a smaller complex and located close to the beach, fun shopping and wonderful restaurants. Amenities include tropical bayside pool, tennis courts, shuffleboard, exercise room and common dock. Call us for more details!! !